Not a Book Snob: Welcome Back, Auntie Mame! I don't know what prompted Brilliance Audio to bring back one of my favorite books ever in a sparkling new audio edition, but all I can do is say...Thank You! 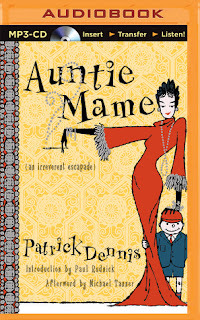 Anyone who has seen the stellar Rosalind Russell movie or the smash hit Broadway show knows the story well; the orphaned 10-year-old Patrick Dennis goes to live with his madcap New York socialite Auntie Mame and begins an upbringing unlike any other. Mame is one of the iconic figures of American literature and the novel was one of the best-selling books of the twentieth century. Auntie Mame is a witty, hilarious and charming skewering of all that was conventional and pretentious in American life from the 1920's until the 1950's. I probably read the book when I was about 15 and loved it. I can only say that with a few(!) decades of life experience it is even better. There are episodes that were not in the various movies and shows that I have seen since I first read it. In some ways, it was almost new for me. Christopher Lane provides a pitch-perfect reading of the novel and I highly recommend this new audio version.